What Is A SF-50 Form? Form SF-50 is a Notification of Personnel Action. It includes certain employment data that is useful to an applicant or when applying for another federal job. It is suitable for both former and current federal employees. 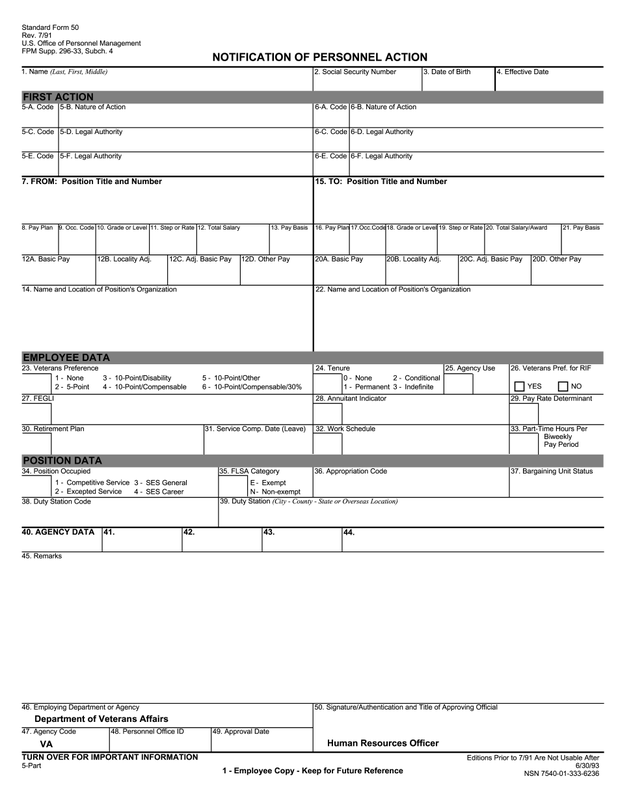 The Standard Form 50 is used for official recording of any changes that occurred in an individual's employment and explaining such actions. It also helps to evaluate the quality of an employer`s performance and to take a decision about his/her employment, salary and professional skills. A document is first prepared by the HR and then it is presented to an employee to check if all details provided are true and correct. signature and title of approving official. Take advantage of signing a document electronically by typing, drawing or uploading. After a blank is completed, you can send it to a recipient straight from the website by e-mail. If required, you have an ability to convert it to other needed format.